In April of 2004, the World of Warcraft Beta began. Some other guilds from battlenet, EQ and other games received what were termed VIP beta accounts. Anywhere from 2 to 10 people from misc groups were admitted into Beta 1 (known has Phase 2) of the beta. The Syndicate was among that group of VIP account receivers however we didnt receive just 2 to 10 accounts. We received many more than that and more than any other group. We were very proud of large number we received due to working hard to achieve our reputation as a stable, long term gaming guild and also as excellent beta testers who work for the good of the game and the community. So while some groups had larger beta guilds, due to recruiting new members with beta accounts, The Syndicate had a large beta guild composed solely of veteran Syndicate members and accepted no new members in the beta. 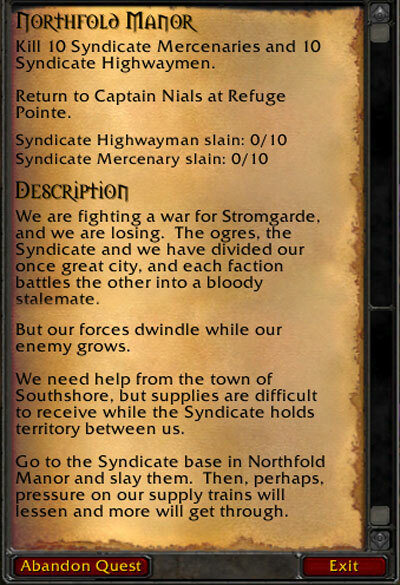 One of the most interesting parts of WoW, that we learned about in the beta, was there was a group of mobs in the game called The Syndicate. They were dressed in Syndicate blue and gray. They dropped an item called Mark of The Syndicate that had no purpose in game. And if farmed enough of them, a named dragon would spawn to attack you or if it was already spawned it would wander by and engage you. The irony that The Syndicate's guildmater is named Dragons and that a named dragon spawns if you kill Syndicate monsters in game was not lost on us. 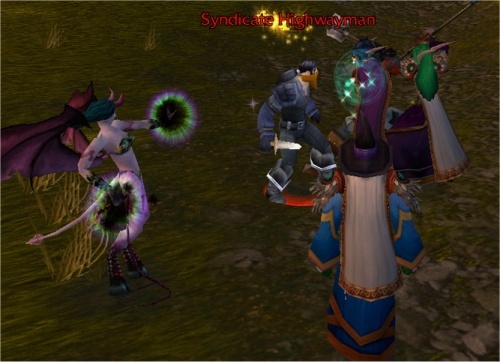 The first faction/reputation in game was implemented with The Syndicate mobs as well. So with all the interesting coincidences (same name, same colros as our guild colors, named dragon etc..) an email was sent to Blizzard asking about the monsters. A reply was forthcoming that read as follows: I'm glad you are all enjoying the game. We've worked a long time, and it's wonderful to be able to share what we have so far with others. As far as The Syndicate monsters in game goes, I can neither confirm nor deny any guild influence in the matter. *wink* Let's just say we all thought the name sounded pretty cool. Right *wink* we understand. Cant confirm or deny :) Well thank you for the monsters named after us. We appreciate you thinking of us and the diablo II site that had some monsters named for them :) It is refreshing to see a developer recognizing community support and large supportive guilds the way Blizzard does. There are also some neutral quests in Alterac Valley with significant rewards for whichever side can complete them first. At a Syndicate hideout in the Valley, you can meet a neutral Syndicate NPC, who will give you a quest to recover a Syndicate artifact called the All-Seeing Eye. It's been stolen by the elite trolls in the ice cave, and if you recover it for him, he will let you use it, and pledge his Syndicate bandits to your side. The twist with this quest is that once you get the Eye from the cave, you must bring it back to the Syndicate leader. But while en route, you'll be tagged with a glowing aura. If the enemy faction manages to kill you before you return the Eye, they can loot it off your body and finish the quest for you, thereby stealing the Eye and the Syndicate for their use. Once again it is great to be a part of WoW and even cooler to be immoratalized by the developers into the game. Thank you!